We have had online shopping for a long time. Indeed, the first online consumer purchase was made in Gateshead, UK, in June 1984 by a 72-year-old lady, Mrs Jane Snowball. She did her shopping at Tesco using an online system that was connected to her TV set and telephone. This was five years before the invention of the World Wide Web. Once we had websites, things started to accelerate. Yet it wasn’t until 27th April 1995 that the first book was sold online by WHSmith – months before Amazon started trading ((Click.ology: What works in online shopping, By Graham Jones, Nicholas Brealey Publishing, 2014)). Online retailers trade on the convenience of their offer. You would think that given we have all become even busier since the 1980s, we would all lap up the convenience of online shopping. Yet, in spite of the evident growth in shopping online, we persist in buying things from the real world, even if that is less convenient. Online stores will be eager to tell you about growth rates of more than 10% a year. But 10% of not very much is still not very much. Almost 90% of everything we buy is still purchased in real world stores. Little wonder that Amazon is investing heavily in bricks and mortar these days. Just a few months ago I wrote that online shopping appeared to have stalled. Now, there is new research that confirms people still prefer real world shops, in spite of more than two decades of online shopping. This new study shows that even the so-called darling of online retailers – mobile shopping – is still a minority activity. People prefer real shops, which begs the question why are so many online retailers failing to achieve the obvious benefits of the convenience of online shopping? After all, you have to travel to a real world shop, you have to pay for fuel and parking, plus you might get wet if it is raining. Why do that when you can sit on your sofa at home in the warm, or while sunning yourself on your patio with a glass of bubbly in hand? Worse still, you might get all the way into town only to discover that the item you want is out-of-stock. What a waste! With online shopping, you would just click to another store in seconds. When you add up all the problems with real world shopping, online retail is a “no brainer”. However, we still like real world shopping. So, online retailers must be doing something wrong, surely? What’s wrong with online shopping? The world of online retail is so convenient that any minor slip-up in that level of convenience is massively noticeable. Most online shops are inconvenient compared with Amazon, for example. Amazon has the ability to buy items with a single click. That’s because they patented “one click” shopping. Yes, I know you are going to tell me that the Apple Store has one-click shopping too. But that only happens because Apple pays Amazon a royalty to use its patented technology. So, compared with Amazon, almost every online retailer is slightly less convenient. But it gets worse. There are online stores that require you to register with every last possible detail about you, in order so you can spend a couple of dollars. Similarly, there are online shops that take you through several pages of shopping cart levels, only for you to discover at the last moment that there is a massive shipping cost added to your bill. Plus, there are stores on the web that have no obvious place where you can get help or support. Compare these factors with real world shops. In a bricks and mortar store, you don’t have to fill in pages of information to make a purchase. Neither are you given any surprises on the bill at the very last moment. And there is usually a sales assistant you can ask for help. One of the reasons why we like shopping in the real world is because the convenience extends to the actual shopping itself. The act of buying is more convenient in many real world stores than it is online. Amazon succeeds because the act of buying there is so simple. Other online retailers need to take note. Convenience is not just about being able to shop 24/7 in your jim-jams. It is also about the act of purchasing itself. Far too many online stores and shopping carts miss out on this issue, making real world shopping more attractive. 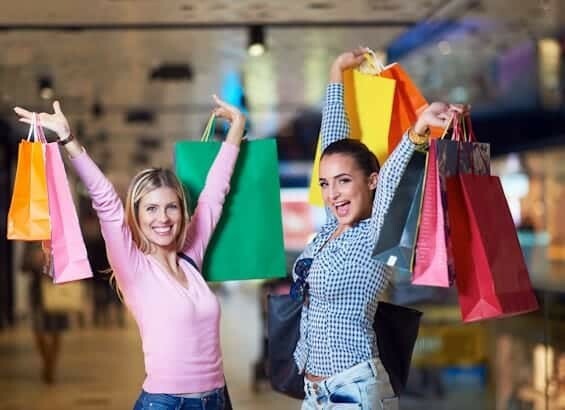 One of the reasons why real world shopping is so attractive is because bricks and mortar stores understand their customer needs more than many online retailers seem to do. Does online marketing produce a return? I agree that Amazon certainly has developed one of the best online buying experience in terms of ease of use. I also think that trust (or lack thereof) is a major obstacle for many online retailers. For example, I believe that the inclusion of actual customer reviews greatly increases the trust factor for an online retailer. If there are no user reviews, I typically won’t even consider making a purchase online…or will just go to Amazon, check the reviews, and buy it there.